Research is an essential part of the UNIPS-project. UNIPS-research started in 2017 by drawing the frames and collecting data. More data has been collected during 2018 and the first papers have been published. Data collection will continue throughout the project and all the publications, refereed articles and conference presentations will be collected here. 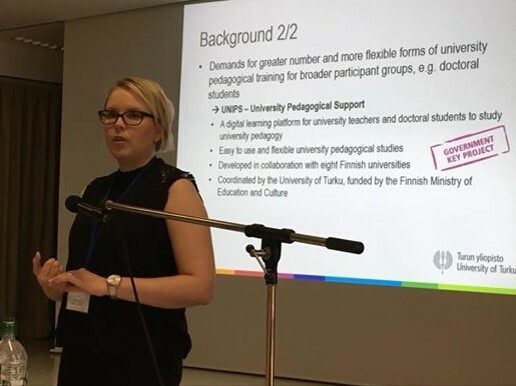 The UNIPS learning solution is based on the idea of the UTUPS (University of Turku Pedagogical Support) solution funded by the University of Turku, Finland in 2015-2017 and publications concerning UTUPS will also be found here. Södervik, I., Vilppu, H., & Murtonen, M. (Draft). Higher education teachers’ conceptions about the role of prior knowledge in learning. Vilppu, H., Södervik, I., Postareff, L., & Murtonen, M. (Submitted). The effect of short online pedagogical training on university teachers' and doctoral students' conceptions of teaching. Laato S., Salmento H. and Murtonen M. (2018). Development of an Online Learning Platform for University Pedagogical Studies-Case Study. A paper presentation at the 10th International Conference on Computer Supported Education, March 15-17, 2018, Funchal, Madeira, Portugal. Murtonen, M. (2018). UNIPS – University Pedagogical Support. A Presentation at Korkeakoulujen henkilöstön pedagogisen ja digitaalisen opetus- ja ohjausosaamisen vahvistaminen –kärkihankkeen symposium. Peda-forum seminar, August 15 - 16, Turku, Finland. Murtonen, M., & Salmento, H. (2017). University teachers’ conceptions of the development of scientific thinking in relation to their use of engaging teaching methods and amount of pedagogical training. A paper presented at the SIG4 Higher Education Invited Symposium, at the European Association for Research on Learning and Instruction (EARLI) Conference, August 29 – September 2, Tampere, Finland. Murtonen, M., & Salmento, H. (2016). UTUPS – University of Turku Pedagogical Support. Paper presentation at the Peda-forum seminar, August 17-18, Jyväskylä, Finland. Nori, H., Salmento, H., & Murtonen, M. (2017). UNIPS – Yliopistopedagogiikan digitaalinen oppimisratkaisu. Paper presentation at the Peda-forum seminar, August 16-17, Vaasa, Finland. Södervik, I., Murtonen, M. & Vilppu, H. (2018) Higher education teachers’ and doctoral students’ conceptions related to the role of prior knowledge in learning. Paper presented at Earli Conceptual Change SIG conference, August 2018. Södervik, I., Vilppu, H. & Murtonen, M. (2018) Higher education teachers’ conceptions about the role of prior knowledge in learning. Paper accepted to be presented at ISSOTL conference, October 2018. Vilppu, H., Murtonen, M. & Södervik, I. (2018). Impact of online courses on university teachers’ interpretations of teaching-learning situations. A paper to be presented at ISSOTL18 conference “Toward a learning culture”. 24.-27.10.2018, Bergen, Norway. Vilppu, H., Murtonen, M., Södervik, I. & Postareff, L. (2018). University teachers’ interpretations of teaching-learning situations – a pretest-posttest design. A paper presented at the Topography of research on higher education: Promoting deep conversations (EARLI SIG 4 Higher Education conference). 29.-31.8.2018, Giessen, Germany.